Kirkland Lake Gold is a mid-tier gold producer with target production in 2018 of over 620,000 ounces from mines in Canada and Australia. The production profile of the Company is anchored by two high-grade, low-cost operations, the Macassa Mine located in Northeastern Ontario, and the Fosterville Mine located in the state of Victoria, Australia. Kirkland Lake Gold’s solid base of quality assets is complemented by district scale exploration potential, supported by a strong financial position with extensive management and operational expertise. 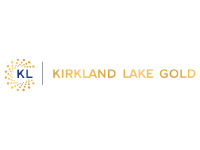 Kirkland Lake Gold is committed to delivering low-cost production, advancing its exploration and development pipeline, and maintaining a large resource and reserve base of quality assets to foster future production growth. Extensive exploration potential, improved visibility to increase mine life, and excess milling capacity at each operation, positions Kirkland Lake Gold to organically grow production to increase value for its shareholders.